Yesterday's post had one contemporary Anglodigit poised to save The Netherlands. Today, I found the real thing. The Dutch take their legends seriously, so here he is, Hans Brinker by name, the son of a Dutch sluicer, as they were called. Little Hans knew that even the tiniest trickle through the dykes his father so lovingly maintained could destroy the earthworks that kept his country dry, much of it below sea level. So behold Hans, digit inserted after he spied a leak on his way home one evening, supposedly retaining finger in place right through a cold night until a grown-up found him and did the sensible thing. Stuffed it with a handkerchief and went home for a coffee? 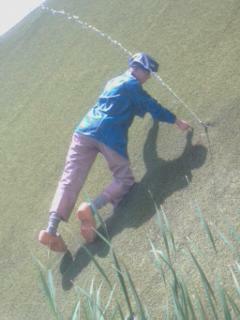 I hate that legend. And indeed, the statue outside the Madurodam park in The Hague, representing Holland in miniature, doesn't seem to be doing much to stop the flow, which continues to spurt resolutely out of the Astroturfed mock dyke. Ah well. 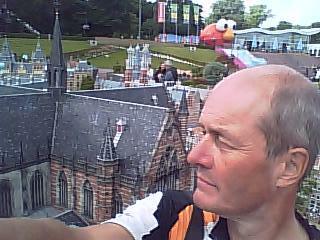 The other photo of me, in handsome profile, is inside Madurodam itself, model palace in the background. Why? Na und? If you look very closely (I think) you may be able to see a very white streak of untanned face down the left side of my visage, just in front of the ear. I don't like to look in the mirror too much on this trip, but I did notice at the campsite last night that wearing an appropriately-strapped bike helmet when cycling west all day for the past month has tanned the face, but not, of course, under the strap. The right side of said visage doesn't have the same problem, and is rather less tanned in general. So, to forestall too much shock to family and friends when I get back, I cycled today – of course, less sun – down to Rotterdam through The Hague (no Milosevic to call in on any more) and Hook of Holland (much trained through during my student days on the way to and from Moscow) sans helmet. Daring, or what. My kids used to get bawled at by me if they cycled without helmet, and one indeed saved my life in 1997 when I crashed near Archway in London, riding stupidly over a Cola can which jammed in my front wheel. No Cola cans today. And like 99% of Dutch cyclists, who don't generally wear helmets unless they're also in Lycra on racing bikes, I survived the 70-odd miles to Rotterdam, and hope I have evened out the facial tan just a little. Ah, the demands of fashion and appearances…. One other thought today that amused me. Dutch place names. Nearly cycled through Monster this afternoon, but got lost between The Hague and The Hook. And definitely cycled close to Sexbierum yesterday. Works in German – the English translation would be Sexbeerum. Tomorrow and Friday will be hard rides. I've taken it a bit easy this week, stopping for coffees and a bit of sightseeing – cf Madurodam. But Brussels is a tad further from here than I thought. So, very early start in the morning from a mid-city Rotterdam campsite (hope they're open when I get there…) and MILES. PreviousDykes and perspectives. And BBC Europe.